Widmer’s Model E-3 electric embosser is instantaneous, accurate and low cost. This embosser is perfect for single sheet Diplomas, and other legal documents. This rugged and reliable machine is perfect for single sheet certificates, diplomas, and legal documents. Single hand operation, no buttons to push. The trigger mechanism can be set to at the same consistent depth and an optional guide shelf is available to allow for correct positioning every time. 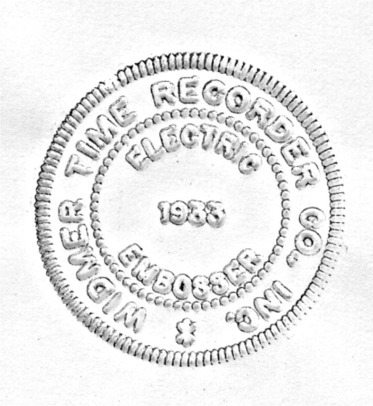 Stamping pressure can be easily electronically adjusted so the dies do not cut through the document. The seals can have simple engraving, text only (included at the base price) or complex designs on quote. Seals can print on the edge of the document, using extension trigger option, or up to a maximum of 3” in depth. There is no standard trigger depth as it would vary with the diameter of the seal. A 1-1/2 ", 1-3/4" or 2" diameter, TEXT ONLY seal included. Text only Seal included in price. Additional charges for State Seal or Custom Seal with Art Work. The seals can be designed from the most simple to the most complex. Please call for individual pricing. The Widmer E-3 electric embosser is perfect for single sheet and two-part carbonized forms, as well as certificates, diplomas, and legal papers. Automatically stamps documents placed beneath print head; no handles to pull or buttons to push. It can easily be set to stamp at the same depth consistently and accurately. The optional guide shelves allow for exact positioning every time. Optional foot pedal, security lock, guide shelf, visual counter and extension trigger also available. Seals can be imprinted to within 2" from the edge of the document. 1-3/16" to 2" adjustable throat depth to accomodate different size forms.